As part of this month’s international celebration of the birth month of Charles Darwin, the UO Museum of Natural and Cultural History will feature two public talks that dive into the world of ancient fishes. The Darwin Conversations are organized annually by the museum. This year’s events will feature UO paleobiologist Edward Davis and paleontologist Kerin Claeson from the Philadelphia College of Osteopathic Medicine. 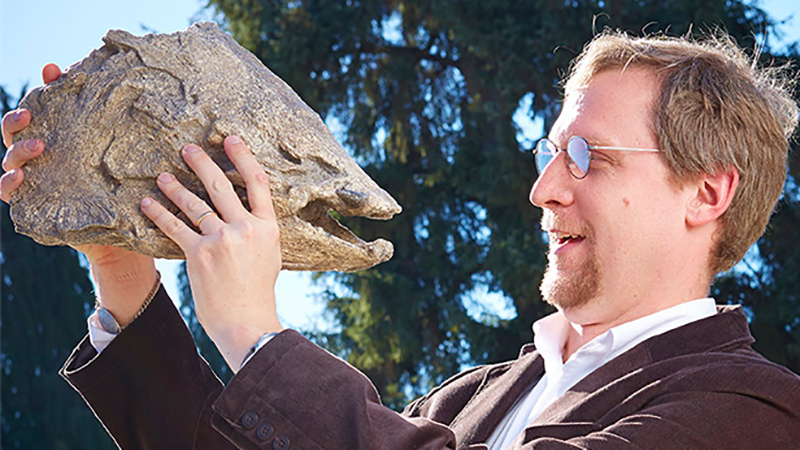 On Friday, Feb. 9, Davis will kick off with “The Fanged Fishosaurus: Oregon’s Sabertooth Salmon,” exploring scientists’ evolving picture of a giant fish that called Oregon waters home millions of years ago. Davis will share his own research and where it’s headed, highlighting recent discoveries that have changed what was believed about sabertooth salmon. The series continues Friday, Feb. 16, with Claeson’s “Adventures in Antarctic Paleontology,” retracing her 2016 fossil-finding mission to the Antarctic Peninsula and discussing clues about the evolution and distribution of ancient marine vertebrates that lived near the South Pole. The talks will take place at 5:30 p.m. at the museum on the UO campus. The series is open to the public and admission is free. The talks go hand in hand with the museum’s H2O Today exhibit, which opened Jan. 20 and investigates relationships among people, Earth’s water sources and the wider environment. Blending interactive displays from the Smithsonian Institution with UO research, the exhibit zeroes in on ways people can better steward the planet’s water supply.